NEW YORK (CNS) — Don’t mess with Mom; that’s the message of the less-than-credible and excessively violent thriller “Breaking In” (Universal). As it strains its tenuous premise, the film approaches a conclusion calculated to appeal to viewers’ worst instincts. 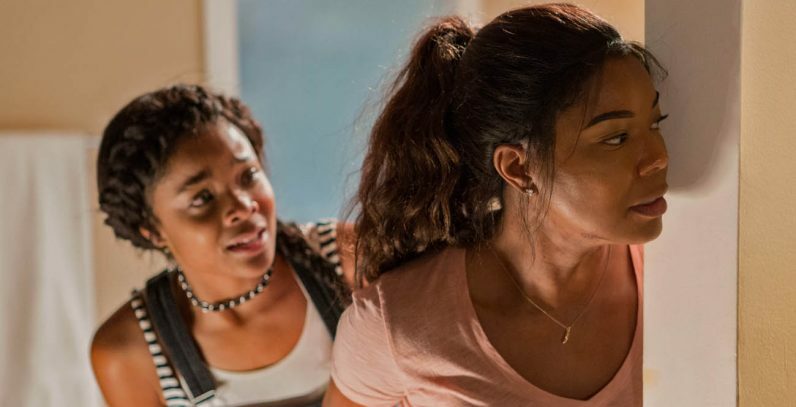 In the wake of her estranged father’s death, ordinary wife and mother Shaun Russell (Gabrielle Union) drives herself and her two kids, teen Jasmine (Ajiona Alexus) and preteen Glover (Seth Carr), to the old man’s isolated estate on the shores of a Wisconsin lake to prepare the place for sale. What she doesn’t realize is that she’s headed for a rendezvous with a group of hard-bitten gangsters. Shady Dad, it seems, had a vast sum of cash stored in the fortress-like house’s hidden safe. This has drawn the attention of ex-cons Eddie (Billy Burke), Duncan (Richard Cabral) and Sam (Levi Meaden) who, together with tech-whiz Peter (Mark Furze), have hatched a scheme to purloin the loot. Shaun notices various things amiss on arrival. But before she can figure out what’s going on, the thugs have taken Jasmine and Glover hostage inside the apparently impenetrable home and locked her out of it. Whereupon Ma’s maternal instincts go into overdrive. What ensues, under James McTeigue’s direction, is a contest of wills that finds Shaun displaying all the skills of a veteran commando combined with the psychological chessboard moves of an ace spy. This would have been more believable if Ryan Engle’s script had given Shaun a military or intelligence background. As it is, she goes from sipping on a glass of wine and chatting on her cellphone to jabbing her thumb halfway through Peter’s left eyeball in no time. And that’s just the start of her rampage. Sam is shown to have scruples about harming the children, doubts which are most emphatically not shared by psycho Duncan. But overall, “Breaking In” indulges in the old ploy of setting up a single villain or an ensemble of bad guys so relentlessly wicked that the audience can exult in their grisly downfall. Here that visceral appeal may be somewhat blunted by the unintended laughs Shaun’s over-the-top feats of derring-do have a tendency to evoke. The film contains much harsh, gory violence, including the preliminaries of a sexual assault, a few uses of profanity, at least one milder oath, a single rough and numerous crude terms and mature references. The Catholic News Service classification is L — limited adult audience, films whose problematic content many adults would find troubling. The Motion Picture Association of America rating is PG-13 — parents strongly cautioned. Some material may be inappropriate for children under 13.